I've created this Warm Hues group as a counterpart to my Cool Hues group. I decided the rest of the color spectrum deserved equal time. I listed the warm "ROY" colors (red, orange, & yellow) in the Group Avatar. I also added the colors tan and brown. Usually, they are warm colors also and go nicely with the other three. Wallpapers in the colors mentioned above are welcome. The colors can be in combinations, or have an emphasis on 1 color. Please try to keep cool hues (blue, green & purple) out of what you submit as much as possible. The primary purpose of this group is to keep the warm colors on center stage. Keeping Warm Hues Separate From Cool Hues Isn't Always Easy! 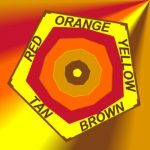 This group is for people who appreciate the warm tones of red, orange, yellow, golden, tan, and brown. Did I just hear you say that you don't have any warm colored wallpapers to add? Try answering the following questions. Do you have any sunrise or sunset wallpapers? How about foods such as bananas, grapefruit, carrots, or tangerines? How about Halloween, Thanksgiving, and Autumn wallpapers? Many floral wallpapers with red, golden, or yellow blooms will fit in nicely also. SURPRISE!!! "Quiet Simplicity" has NOT been deleted after all!